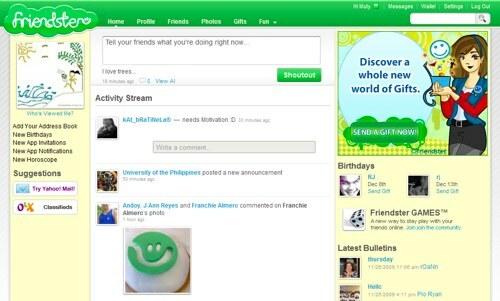 Brace yourself as Friendster makes a totally new facelift as it launches the new Friendster worldwide on December 4, 2009 (Friday) with the slogan, "Connecting Smiles." I still remember how I got hooked to Friendster in 2003 just to get connected with my friends and relatives around the globe. I must say that Friendster was an addiction as the internet bandwagon and social networking site such as Friendster invaded the silent and boring lives of Filipinos. I couldn't imagine that Friendster has changed the way we look at online friendship and connection. You will be surprised with the many changes that the people behind the new Friendster have concocted for our pleasure and entertainment. There will be a lot of freedom in the way you want your account page to look. You can customize the template theme with the new ccs upload feature, games to play, unlimited photos to upload, commenting capabilities, sharing various stuffs with your friends, etc. Friendster has never been this fun! The new Friendster logo will now be in color green, written like a long rope making up all the letters of the word with the smiley at the end. For those who never had a Friendster account yet, this is your chance to experience an exciting way to connect with your friends online. Go check out your account now or go to http://www.friendster.com to set up your very own Friendster account. Photos were lifted from Rochelle Sy Chua's website.